Why Choose Joyoshare iPhone Data Recovery? Suppose you're seeking for an iOS data recovery tool to recover lost data from iDevice, and when you google it on the Internet, you'll find there are so many results appear. You may have no idea how to choose the best iPhone data recovery software among them. Here we're going to introduce a professional and reliable iOS data recovery utility called Joyoshare iPhone Data Recovery and make a complete review about it for your reference. Part 1. 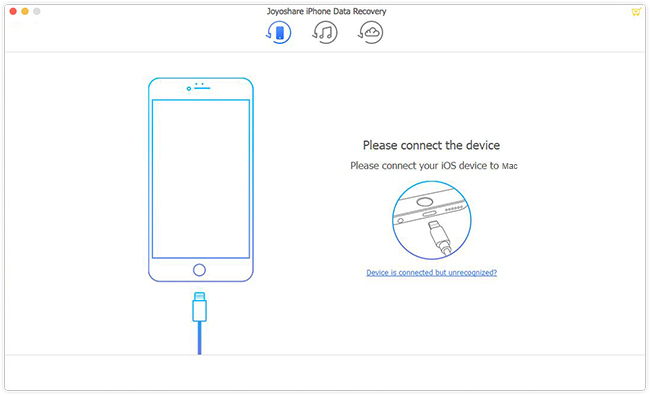 What Is Joyoshare iPhone Data Recovery? Joyoshare iPhone Data Recovery for Windows (or Joyoshare Mac iPhone Data Recovery) is an easy-to-use yet powerful iOS data recovery program that can recover lost or deleted data from iPhone, iPad and iPod touch, no matter how you lost them such as an accidental deletion, iOS upgrade failure, factory reset, device stuck and so on. It supports up to 20+ types of lost files including contacts, messages, photos, videos, notes, third-party app data, etc. With the support of 3 recovery modes, it is capable of recovering lost data from iOS device directly, iTunes backup or iCloud backup, etc. With the advanced technologies adopted in Joyoshare iPhone Data Recovery, this smart tool gives you access to preview the data in real time, and all your selected files will be scanned and recovered at a super fast speed. Additionally, even though your lost files are encrypted, Joyoshare can also help you get them back. Next, let's move to the next part to elaborate on the outstanding features of Joyoshare iPhone Data Recovery one by one. Joyoshare iPhone Data Recovery is a wonderful iOS data recovery program that packed with a lot of remarkable features, which makes it stand out from its competitors in the market. Now it's time to dive into it in details. Losing iPhone data always happens. For example, you may delete your photos by mistake; your iPad is dropped into water accidentally; you upgrade iOS system but it failed; your iPhone is stuck on white Apple logo with no reason, etc. All these may lead to data loss. But don't worry, Joyoshare iPhone Data Recovery is here to help you salvage lost files from all these scenarios. Even if your device is lost or stolen, it can still retrieve your lost data from iTunes or iCloud backup. 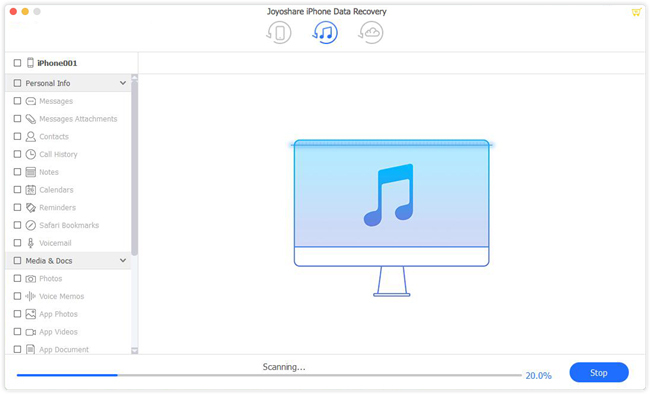 Another distinguished feature of Joyoshare iPhone Data Recovery is that it supports 3 recovery modules: Recover from iDevice, Recover from iTunes, Recover from iCloud. If you have no backups or your backup files do not contain your lost data, you can choose the first mode to get the real-time data from iOS device directly. If you want to restore your older data, you can choose to recover from iTunes backup quickly. If you want to obtain the latest lost data from backup, you can try recovering from real-time backup on iCloud. With innovative technologies implemented in Joyoshare iPhone Data Recovery, it has achieved a lightning-fast speed to scan and analyze the iTunes backup, download iCloud backup, preview the lost files, and restore the data finally. And consequently, Joyoshare will take less disk space compared with other competitors. So, it has now become one of the fastest iOS data recovery utilities in the market. Before recovery, you're able to preview all the data files in real time, no matter they are text files or video/audio files, so that you can clearly understand whether they're the files you want to recover, and thus make the right decision. By using Joyoshare iPhone Data Recovery, it will never overwrite the existing data on your device. So don't worry that your current data will lose. Another point is that, only you can access to your personal iCloud account, and Joyoshare will never keep a record of your privacy info and content. When you open Joyoshare iPhone Data Recovery, you'll be surprised on its neat buttons and intuitive interface. Joyoshare program is user friendly and easy to navigate, and the recovery process only needs three steps, even someone who have no any technical skill can finish it without any hassle. Now you know the main features of Joyoshare iPhone Data Recovery, but what are the advantages and disadvantages of it compared to its rivals? Now let's come to the discussion below. 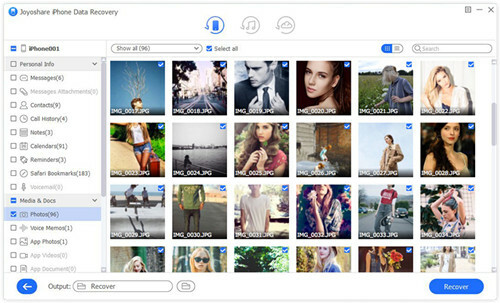 Different from the similar software, Joyoshare iPhone Data Recovery adopts advanced technology to analyze and scan lost files, so that users will take less time to scan the data from iTunes or iCloud backup files, and they can also preview the files quickly. At the same time, thanks to this technology, Joyoshare program will take less disk space and resources to analyze the files. Thus, it has now becomes almost NO. 1 fastest iPhone data recovery software. 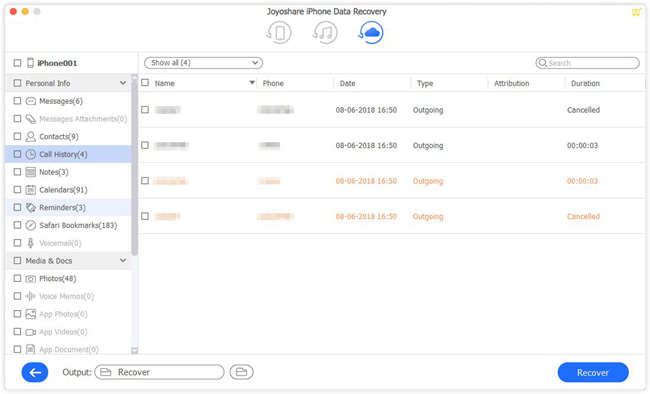 Another unique characteristic of Joyoshare iPhone Data Recovery is that it enables users to connect several different iOS devices to the computer and can be detected by the program, so that you can easily switch among these devices to try recovering lost or deleted data as you like. Most iPhone data recovery software supports real-time preview function, but almost all of them cannot support to preview video and audio files before recovery. However, Joyoshare can do this job well without any problem. As long as you have upgraded the trial to the full version, you can quickly preview any audio and video file, not just thumbnails. This is another unique advantage of Joyoshare iPhone Data Recovery. The software allows you to set preferences according to your needs, and one of them is to convert HEIC to JPG by ticking its checkbox. It means that Joyoshare app will recognize all your HEIC pictures and help you convert to JPG once the recovery process completes. Besides, you can also customize the output folder and backup temp location, choose an output formats of data in HTML or CSV, and so on. Note: Joyoshare HEIC Converter can also help you convert HEIC to JPG, PNG, GIF, BMP and other common formats easily and professionally. Up to now, Joyoshare iPhone Data Recovery has tested many models of iOS devices and iOS version, yet there may still are some bugs. Joyoshare R & D team is still (and will always be) making efforts to improve it and try to make it perfect. Joyoshare iPhone Data Recovery software offers a free trial version for users to analyze and scan the lost or deleted data from iOS devices, with almost all the features offered. Users can get free download from its official site and have a try. But if you want to recover the lost data, you need to purchase the full version. Before restoring any lost iPhone data, you have to download Joyoshare iPhone Data Recovery and install it on your computer. Here we take Mac version as an example. After installed Joyoshare program, simply launch it on the desktop. On the main interface, you can see there are three recovery modes offered. If you choose to recover from iDevice, you need to connect your device to the computer with a USB cable. When Joyoshare detect your device (or iTunes/iCloud backup files), you can now choose the data types such as Messages & Attachments, Contacts, Call History, Photos, Videos, etc. and then click the "Scan" button to let Joyoshare start to analyze and scan your lost data. If you choose to recover from iCloud backup, you need to sign in your iCloud account first. Wait a while until the scanning process is done. Now you can preview all recoverable files in categories. You can also enter a keyword to search for a specific one or filter out the deleted ones by choosing the right option. Next just click the "Recover" button and all selected files will come back to your computer in seconds. Note: This is only a simple guide, if you're still not clear enough, you can see the complete guide here >>. Compared with similar products in the market, Joyoshare iPhone Data Recovery is quite affordable. Its price varies from $49.95 to $359.95 depending on the different numbers of iOS devices you need to recover data from. All plans are lifetime license, with free technical support and update. The most popular one is Multi-User plan, which can be used by you and all your family members to recover lost or deleted data from iOS device directly, view and recover data from iTunes or iCloud backup without restoring your iPhone. No matter which plans you choose, once you buy the software, you will receive an active registration code immediately and then you can use it to recover lost data from iPhone. For more info about the price, please visit its purchase page here >>. As for the availability, Joyoshare iPhone Data Recovery is currently available for both Windows and Mac version, including Windows 10/8/7/Vista/XP and Mac OS X 10.6, 10.7, 10.8, 10.9, 10.10, 10.11, 10.12 Sierra, 10.13 High Sierra, and 10.14.
iPhone Storage Almost Full? 10 Tips to Fix it!